During the hottest summer days, even toasting a slice of bread seems to make the kitchen hotter. During the dog days of summer, I do everything I can to avoid extra heat, especially when it comes to mealtime. Purchasing prepared food is an obvious answer: picking up fried chicken from your favorite roadside shop is a treat and pairing it with some potato salad from your favorite deli makes it a meal. Grilling outdoors is another answer, except it is torture for the person mannng the grill! There are plenty of options for making dinners at home without the use of heat, either by selecting ingredients that don’t require cooking in the first place or by using items that have been cooked elsewhere. Select a rotisserie chicken from the deli or ask the folks in the seafood department to steam a lobster or some shrimp for you to take home. Imported tuna packed in olive oil is a huge treat as is jumbo lump crabmeat, ready to use straight from the container. Ceviche (fish that is ‘cooked’ in a citrusy marinade) is another great option for a ‘no-cook’ dinner. Fresh sweet local corn is a delight and doesn’t need to be cooked, along with other garden treats like snow peas and tomatoes. And don’t forget canned beans which add fiber and great texture to salads. ‘No-cook’ meals and takeout meals share one challenge: because a meal may take less time to prepare or seem more casual, there’s a tendency to throw it on the table and wolf it down without enjoying it. Be sure to take time to make these hot weather meals an occasion. Set the table, serve a special drink and make sure everyone sits down to enjoy the meal together. Try doing something fun like serving the drinks in mason jars or using bright fabric napkins to ground a lighter meal in the summertime. This summer, I plan to have a plan: to make ‘no-cook’ meals regularly and serve them with the same care that I would a meal that I had cooked for hours. 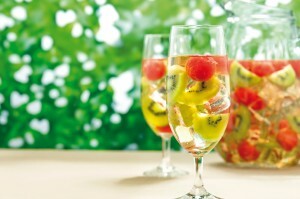 I’ve included recipes for a refreshing cocktail and some refreshing dinner ideas to add to your repertoire. 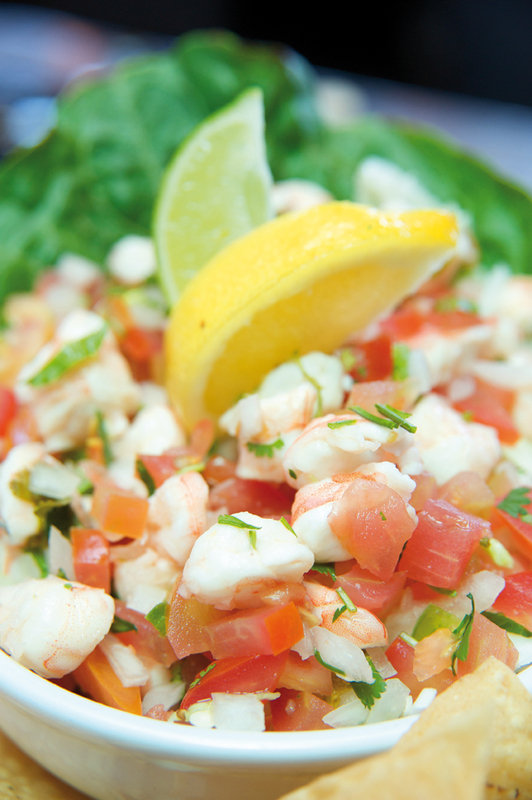 fish for the most delicious ceviche. refrigerate, stirring every 30 minutes for a total of three hours, until the fish is opaque. and pepper. 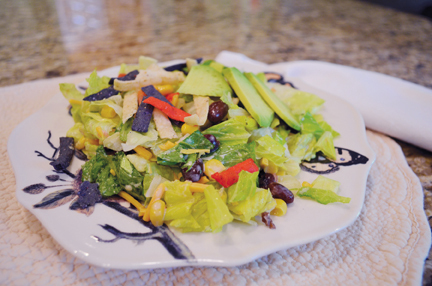 Serve on lettuce with avocado as a starter or main dish. I would never guess that ginger ale would be an ingredient in Sangria, but my Spanish neighbors drink something like this all summer! It’s light and refreshing, and of course lower in alcohol. Combine wine and fruit. Fill a glass with ice. Fill glass 2/3 full with wine/fruit combination and splash with ginger ale. Enjoy! I love a good Cobb salad – chicken, avocados, bacon, blue cheese and hard-boiled eggs with greens. This is a riff on that – to get you thinking of other chopped salad themes. 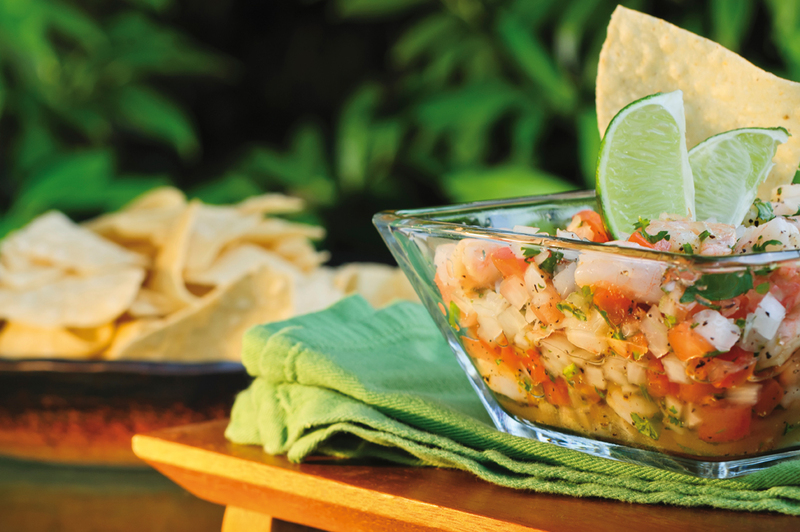 This looks great layered in a clear bowl and tossed at the table. Combine dressing ingredients in a blender or food processor. Add salt and pepper to taste. In a clear bowl, start with salad greens, and then layer with the rest of the ingredients. Drizzle with dressing and toss well. Garnish with lightly-crushed tortilla chips. 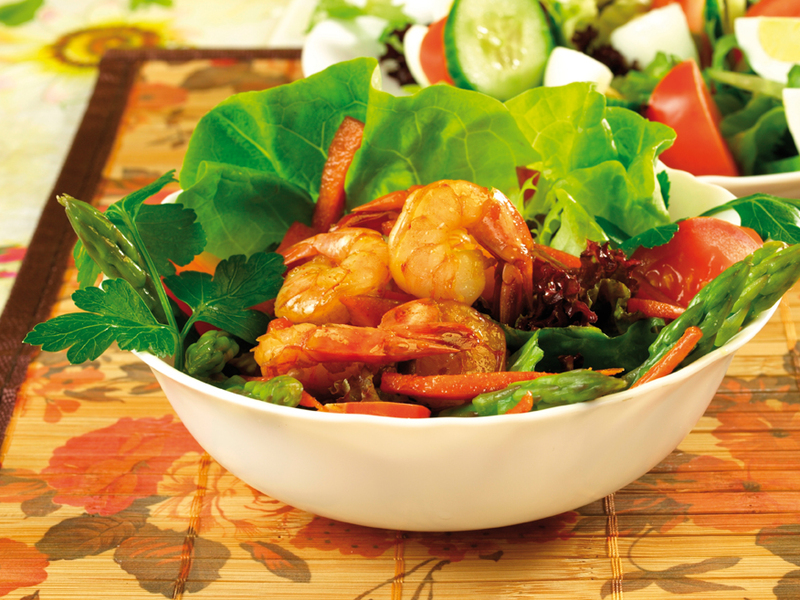 This salad has it all – crunch, spice, creaminess…and no cooking necessary! 1 pound steamed shrimp, peeled and cooled (or substitute 2-3 cups chopped chicken from a rotisserie chicken or leftovers) Combine dressing ingredients in a jar, and shake until they are combined well. Set aside. In a large bowl, combine salad ingredients. Toss with half of the dressing. Top with shrimp, cilantro and peanuts. Drizzle remaining dressing on top.